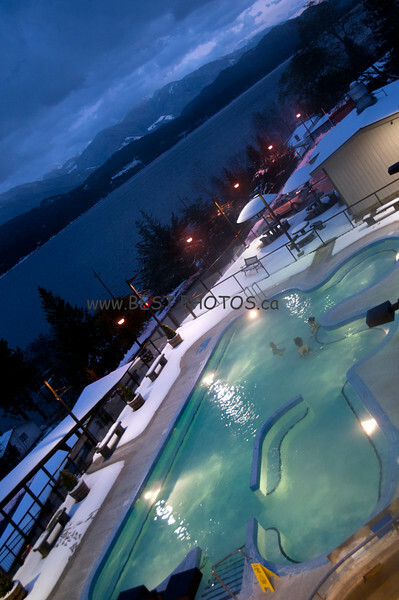 In the heart of the Kootenay wilderness is the tiny village of Ainsworth Hot Springs, set into the mountainside overlooking the vast expanse of Kootenay Lake and the Purcell Mountains. The village is the location of the Ainsworth Hot Springs Resort, whose natural hot springs feature a unique horseshoe-shaped cave where the darkness, the mineral deposits and the humidity all combine to offer an exhilarating experience. In 1882 George Ainsworth of Portland, Oregon, applied for a preemption of the townsite which is now Ainsworth Hot Springs. It was at first called Hot Springs Camp and had been founded on the strength of silver, lead and zinc discoveries in the vicinity. Names like the Krao, Keyline, No. 1, Let-Her-Go-Gallager and Highlander were the foremost of an impressive list of mining properties.